Near Epoulette, north shore of Lake Michigan. 1856, Aug 25 Owned H. H. Smith Two Rivers, WI, Geo. W. Lennox, Master. 1859, Aug 13 Owned H. H. Smith, L. H. Seaman and B. F. Aldrich of Two Rivers, WI. 1860 Collision with schooner BELLE, Chicago, IL. 1863 Owned Mann Bros., Milan. 1864 Described as 137 ton schooner. 1865 Described as 153 gross tons; 137 old style. 1871 Rebuilding to three mast schooner; 120x26x7; 191.83/182.31 tons. 1872 Owned Mann Bros., Sheboygan, WI. 1884 Owned P. Paston, Milwaukee, WI. 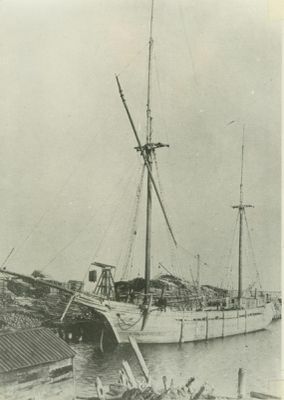 1891 Damaged in squall; loss of one. 1904 Reduced to jackass rig, Grand Haven 123.7x25.2x7.9; 177/167 tons. 1916 Owned J. Huebel; wrecked Davenport, MI; sources report vessel blown ashore on the north shore of Lake Michigan near Epoulette.